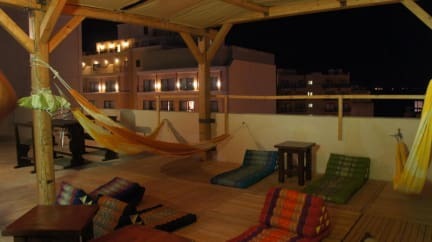 Hacienda Guest house is conveniently situated in the heart of Paceville the entertainment centre in St Julians . Although close to all the major clubs, pubs, restaurants, supermarkets ect , it is still situated far enough from the hustle and bustle that is paceville at night, to be able to provide you with a good night sleep. It is also close to st George's beach, and to many English teaching schools. All our rooms have private bathrooms, and we can provide single, double , or triple rooms. Clients at the Hacienda can make use of all the common areas, including the kitchen, common living room, wash room , and chill out area on the terrace. The hacienda Property has got an international , friendly atmosphere and we take pride in not only hosting our guests, but also in helping them with anything they might need during their stay. At Hacienda you can speak to us in English, Italian or Spanish. The directors of Hacienda are avid travellers and so have the right feel as how a Property should operate. Kindly note that there is an extra charge per night for air condition. Air condition is available only if we are informed as soon as you make your reservation. Payment by cash or credit card on arrival day, please note that there is a 3% charge if you are paying by credit card.